Visiting the Pres' childhood home after his Mom passed away last year was hard on all of us. When my BIL suggested that we dig up "those flowers that grow over there...those big red ones. Mom would want you to have them," I became teary-eyed. So the Pres and I dug, not knowing what we were digging up. All we were told was that they had to be dug up each year. Planting them in a sunny location in the yard, we waited and watched as the foliage emerged. Being much cooler out this way than at Mom's, we worried that they wouldn't make it. If you're interested in Dahlias, here's a great link: Almanac-Plants-Dahlias. The dahlias are gorgeous. Such a pretty color too. I am so glad they survived the transplant. A lovely memory of the Pres's Mom! Enjoy your new week ahead! Dahlias were one of my favorites when I lived in Alaska--And for some reason, I've never been able to get them to grow here in VA, isn't that crazy? But how wonderful to have them in your yard to enjoy and remember, they are really lovely and a beautiful shade of red! They sure are pretty, but I'm not sure what you mean when you say they have to be dug up each year. In 1980 we moved to Oklahoma. My parents came to Virginia to say good bye since we wouldn't be seeing them for a while. I gave my mother one of my large house plants. She had it for years. After she died in 2001 I took a clipping and brought it back to Texas. It rooted and now the plant is probably five or six feet tall. I'm really glad I have it now. It's some kind of philodendron...I think. Gorgeous big blooms. What a lovely reminder. Huge red dahlias! They are gorgeous! She would have loved this. 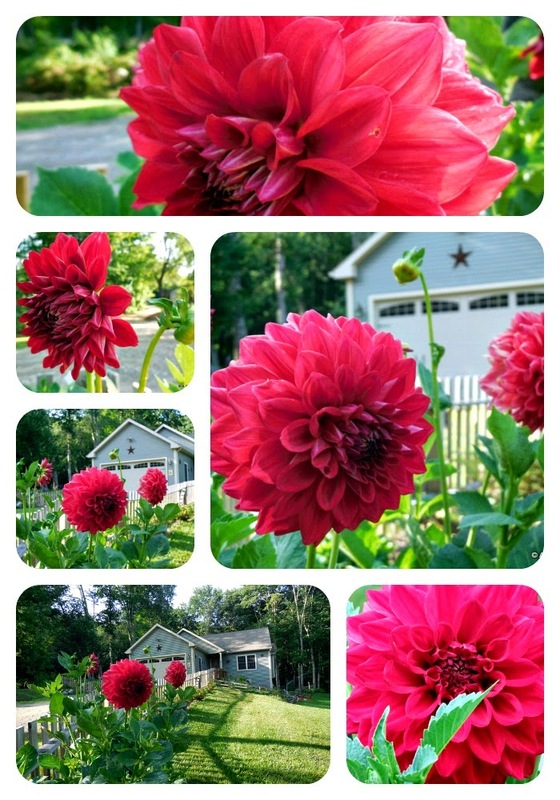 Big red dahlias are a nice way to cherish the memory of your mother, especially since they meant so much to her. How touching that you were able to bring to your garden those lovely dahlias. Your red flowers are beautiful and that is such a special story about how they came to be at your home. The dahlias a beautiful and every year when you replant the tubers and watch them grow and bloom you will have wonderful thoughts of your mother. OOPS! I meant mother-in-law! She must have been a wonderful person. A very nice and beautiful way to honor a special person. I love all flowers and yours are gorgeous. So glad they are doing so well! Red dahlias,so beautiful....such vibrant energy keeping memories alive!